The Wizards turned in their best defensive performance of the season on Monday in beating the Detroit Pistons 101-87, looking like an entirely different team in their first game back from London. WASHINGTON (AP) — Exchanging their freewheeling ways for an improved defensive showing, the Washington Wizards looked like an entirely different team in their first game back from London. 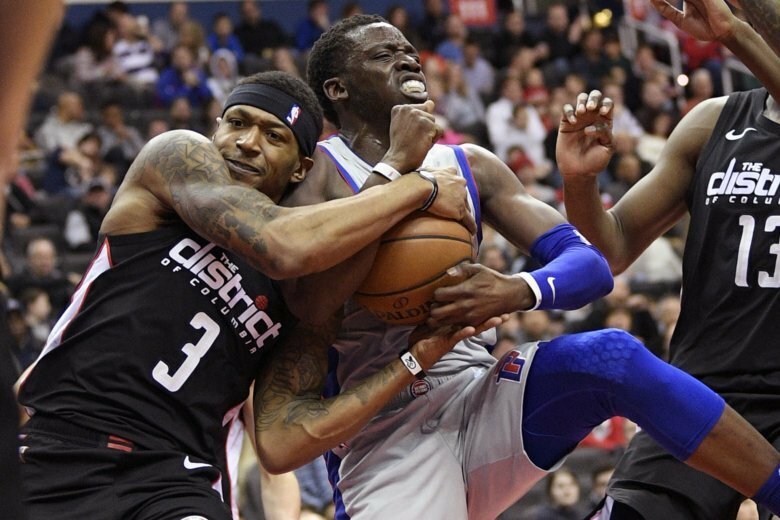 The Wizards turned in their best defensive performance of the season on Monday in beating the Detroit Pistons 101-87. Even though Blake Griffin put up a game-high 29 points, Detroit’s scoring output was the lowest by a Washington opponent this year. After beating the New York Knicks in London last week, the Wizards now have won two in a row and are 7-3 in their past 10 games. Pistons coach Dwane Casey was hoping players would drink a gallon of coffee to be ready for the 2 p.m. start. Instead, Detroit scored just 17 points in the first quarter and was never able to recover. Pistons: Their 34 first-half points set a new season low. … C Andre Drummond missed his second consecutive game with a concussion. Casey said Drummond is still in the concussion protocol and didn’t travel with the team … G Ish Smith sat out for the 21st time in 24 games because of a right adductor injury. Wizards: Beat Detroit for the eighth consecutive time at home. … Tomas Satoransky had a game-high eight assists, including a pass through Zaza Pachula’s legs in the first quarter. … Signed G Gary Payton II to a 10-day contract 15 years after general manager Ernie Grunfeld, then with Milwaukee, traded for Payton’s father. … Played at home on Martin Luther King Jr. Day for the 20th consecutive time and 16th at home over that stretch. The Wizards began bringing Porter off the bench when he returned following a right knee injury to ease him back in. It has since become a habit, not because Porter is still building up but because Brooks likes how his team is playing and doesn’t want to mess with success. Two days after losing to Sacramento on a shot by Buddy Hield that the Pistons thought was a double-dribble, Casey said he’d be on board with a coach’s challenge system — if it can be done quickly without games dragging. Injured Redskins quarterback Alex Smith took in the game from a suite wearing a substantial cast and brace on his right leg. Smith, who broke his tibia and fibula Nov. 18 against Houston, spent almost a month in the hospital after multiple surgeries, and his playing future is in doubt. Pistons: Visit the New Orleans Pelicans on Wednesday in the second stop on their three-game road trip. Wizards: Host the defending NBA champion Golden State Warriors on Thursday.